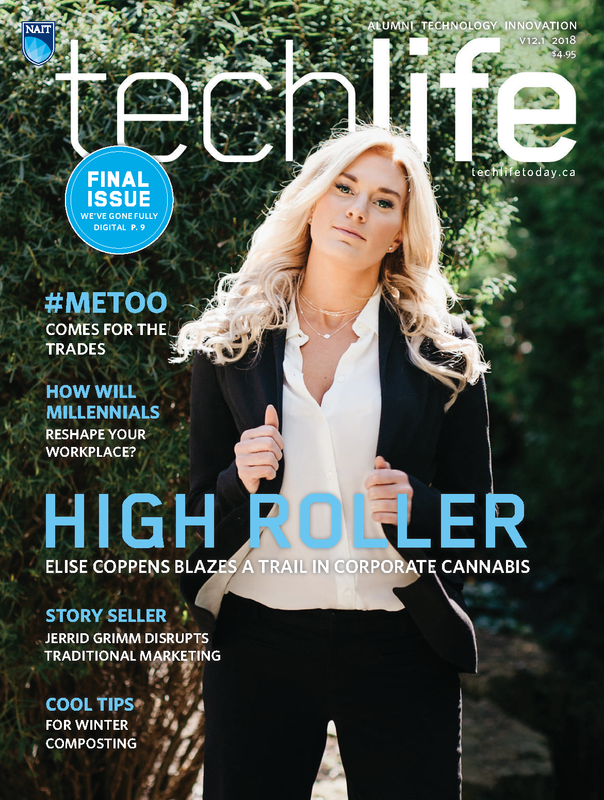 Elise Coppens - cannabis industry pioneer; MeToo comes for the trades; a lost piece of NAIT history resurfaces; Jerrid Grimm’s mission to kill the banner ad; winter composting tips; what millennials want; and more. 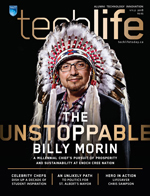 Chief Billy Morin pursues prosperity for Enoch Cree Nation; apprentice Chris Sampson saves a man on the LRT tracks; elite cyclist Ross Wilson won’t be stopped by a muscle-degenerating disease; 10 years of the Hokanson Chef in Residence; St. Albert mayor’s unlikely path to politics; and more. 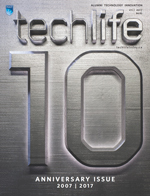 Techlife celebrates 10 years in print; a new fitness program for autistic people and their families; Alberta storm chaser turns entrepreneur; Edmonton-inspired furniture; how to make mead; the pastry boom; Tom Shepansky on being the magazine’s very first cover model; and more. Dave Critchley’s race to save Alberta’s bats; Curtis Krouzel’s award-winning, tech-driven, Okanagan winery; using simulation to teach as if lives depended on it; how to cut your carbon footprint and save money; a new advocate for Alberta trades; NAIT’s unusual rooftop classroom; and more. Marni Panas advances human rights in Alberta; the solar power industry prepares for a brighter future; floatation therapy ebbs toward status as legitimate therapy; Vikram Vij brings food with flair to NAIT; the basics of vinyl record collecting; experimental ice cream; and more. Meg Morrison helps redefine the television career; the Gothic Knight reignites Alberta's passion for pro wrestling; NAIT bakers compete with the world's best in Paris; cross-Canada cycling enters the realm of real possibility; learn the basics of self-defense; the business of bras revealed; and more. Jessica Poirier challenges the persistent status quo of the gender imbalance in the trades; Jay Downtown takes an innovative, community-minded approach to bolstering Edmonton's creative economy; alum-MLAs weigh in on Alberta's future; NAIT celebrates 15 years in Cuba; restaurateur Sylvia Cheverie dishes on the art of crowdfunding; much more! Vintage toy collector Shane Turgeon discovers there's more to life than stuff; Andrea Peyton collects old toys and other stuff to give kids a chance at a healthy life; Clayton Folkers shows the ways of campfire baking; Chris Klitbo explains how to live through being lost in the wilderness; and much more. Spencer Smirl visits the coldest place on earth; Julie Matthews keeps the peace in the battle between consumers and unscrupulous businesses; Kyle Walton brings back the business of blacksmithing; Brad Kennedy raises the bar in west-Edmonton architecture; and much more. How to save a dying river; Chef Paul Shufelt's recipe for the perfect corporate-creative balance; meet the presidents (of NAITSA past); a look inside the new heart of NAIT; the institute's impact on the province; how to paint your house; much, much more. Bringing new ideas to business, food, sports, life in the city and more. In this issue, we look at alumni who, whether dealing with food, architecture or an entire industry, apply their knowledge and talent to making it new, and making it better. In this commemorative issue of techlife, we celebrate NAIT's golden anniversary, and the more than 170,000 students and thousands of staff and faculty whose lives have been enriched by the school. Innovative alumni and their impact on the future of food, culture, politics and energy. In this issue we celebrate the energy and ingenuity of being on the brink of something exciting - and poised to take the next big step. Whether we consider it a job, a career or our passion, work is a large part of our lives. 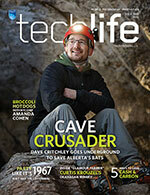 This issue of techlife looks at the business of earning a living. The Oxford dictionary defines "vision" as statesmanlike foresight; sagacity in planning. In this issue, we look at individuals whose vision defines them, whose compelling no-holds-barred leadership not only embodies Oxford's definition, but makes for an inspirational read. With NAIT programs offering training in everything from finance to nanotechnology, thousands of employees and students, more than 150,000 alumni and dozens of industry partners, our access to experts seems limitless. For this issue, we talked with a few of them. We don't all have to be professional athletes to relate to the challenges of setting an ambitious goal and the effort and compromises required to reach it. With a focus on gold-medalists and go-getters alike, this issue examines the nature of the high-achiever. The stories in this issue show people making a commitment to the planet in varying degrees, in their own way, from micro-giving charities to building net-zero homes to developing software to help make the world a safer place. Here, we look at blue-sky thinkers: people passionate about their product or process, whether it's improving our pets' quality of life, providing the less fortunate with access to something as basic as voice mail, or building a vehicle that costs pennies to operate. While exploring the union of design and technology in this issue, we discovered that turning personal passion into success can yield many different outcomes, like eco-friendly design products, skate shoes and even guitar effects pedals. 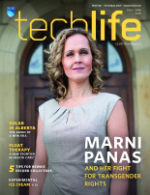 Introducing techlife magazine, bringing stories about people, technology and applied research, and news of what NAIT is doing around the world to alumni, friends, volunteers and partners of one of Canada's leading institutes of technology.